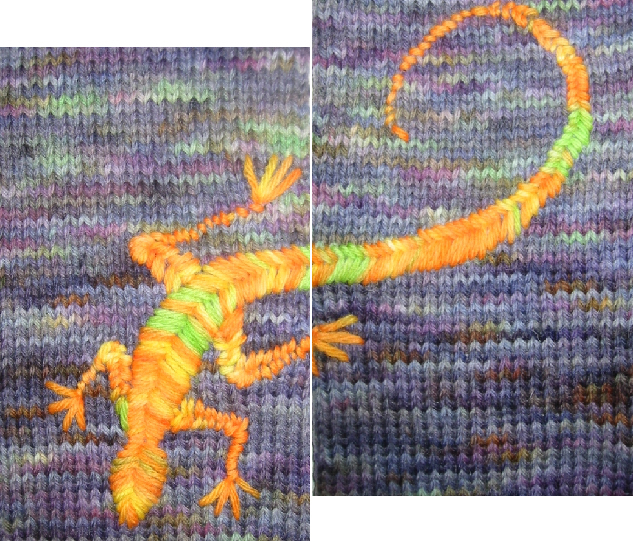 Here's one of my Gallery favorites, Gecko :). 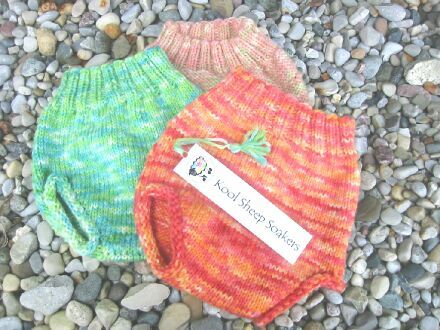 Kool Sheep Soakers are hand dyed and knit by me using 100% wool yarn. The colors are vibrant and fun -- perfect for showing off underneath a white t-shirt! The waistband and legholes are stretchy to fit a wide range of sizes, and the soaker itself is trim enough to be worn easily under clothing. It is a beautiful, breathable cover that works equally well over pinned prefolds and fitteds. Wool is a wonderful water-resistant fabric that is breathable as well as anti-microbial. It can hold in the moisture of a damp diaper, but generally not one that is soaking wet, so absorbent diapers or frequent changes are needed to keep your child's clothing dry. To care for your Kool Sheep soaker, hand wash in warm water with baby shampoo, squeeze out excess water in a towel, and lay flat to dry. Every once in a while, lanolize by shaking hot water, shampoo, and a bit of lanolin together in a jar and adding this liquid to the wash water. Allow to soak for 15-20 minutes, then dry as usual. Generally, you will only need to wash your soaker every two to three weeks and lanolize every third or fourth wash.
Kool Sheep Soakers will be available in-stock and by auction through the KSS in-stock store. If you'd like to know when custom slot auctions are posted or in-stock items are available, please join my Yahoo group at Kool Sheep Soakers. Please visit the Kool Sheep Gallery for a look at past and future soakers. And take a peek at the Kool Lambs Gallery :) If you like our logo and are looking for a little something for your little one, consider the items in our Kool Sheep Accessories store. You can read or leave feedback and comments on Kool Sheep Soakers at Diaper Pin, the Mothering Forums, and the Diaper Hyena.